FUNABASHI, CHIBA PREF. - Gold Actor took center stage in the season-ending Arima Kinen to capture his first Grade 1 victory on Sunday. 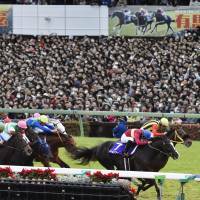 The 4-year-old colt went off as the eighth choice in a full field of 16 before a crowd of 121,319 at Nakayama Racecourse in Chiba Prefecture, and held off Sounds of Earth by a neck to earn a first-place check of ¥250 million. Three-year-old Kitasan Black took third, another three-quarters of a length behind. Favorite and retiring six-time G1 champion Gold Ship ended his stellar career in eighth place. The Tadashige Nakagawa-trained Gold Actor, under Hayato Yoshida, crossed the post in 2 minutes, 33.0 seconds over 2,500 meters on firm going. It was also the first G1 title for both trainer and jockey. “It’s a truly great feeling,” Yoshida said. “I’m glad I was able to get the job done. Growing up, I used to be in the crowd, watching this race from the stands and dreaming of winning it one day. “We had to see how he would hold up against a field as strong as this one. He felt brilliant rounding the last turn and I was sure he’d take off on the straight. Kitasan Black, winner of the Kikka-sho, the Japanese St. Leger, set the pace for the journey, stalked by Lia Fail and with Gold Ship bringing up the rear. 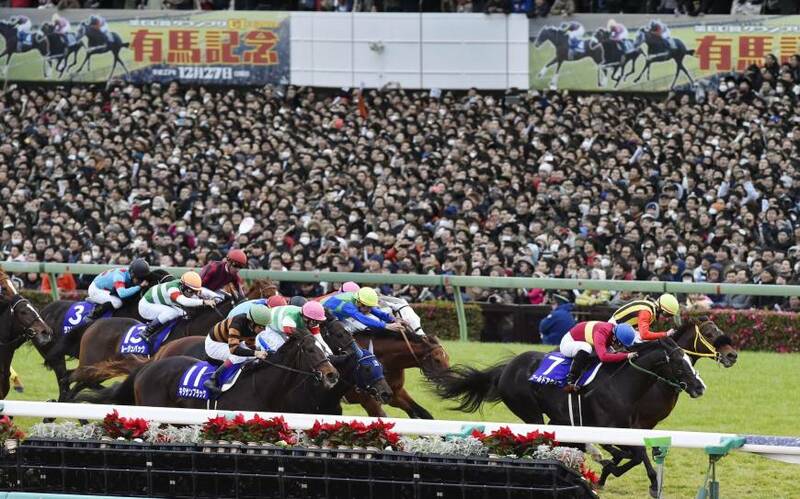 Gold Actor traveled in excellent position near the front, just ahead of the Mirco Demuro-ridden Sounds of Earth. Kitasan Black still led going into the home stretch, making a run for the wire along the rail. Halfway through the straight, Gold Actor overtook Kitasan Black with Sounds of Earth just to his outside. Gold Actor had a smoother final turn than Sounds of Earth and, in the end, it proved to be a difference Demuro’s mount could not make up. Gold Actor, by Screen Hero out of Heilong Xing, only won his first graded race on Nov. 8 in the G2 Copa Republica Argentina. He is 7-for-13 in his career with earnings of ¥419.9 million. A retirement ceremony was held for Gold Ship following the race. The Stay Gold Son won the 2012 Arima Kinen among his six G1 titles, and was winner of this year’s spring Tenno-sho. The 6-year-old finishes with career prize money of almost ¥1.4 billion.